Cosplayers do a great job of bringing characters to life. Some of the hardest parts for a costume can be finding the proper headgear to make it complete. That’s where Moria Silver comes in, the husband-wife duo of Roger and Judy Zimpel has been at Planet Comicon for the last four years with brass and silver crowns on display. Roger explained the lifelong undertaking has become his passion, now retired he treats his trade as his job. He and his wife exhibit their wares at a multitude of conventions and festivals. But his love of metalworking began when he was only a child. Shortly thereafter, Roger said he moved back to the Midwest and started doing science fiction conventions, comic cons, and Renaissance festivals. He’s based in Alton, Illinois with a 4,000 square foot shop with every tool he’s ever wanted as well as his dad’s rock shop, and his mom’s stained glass shop. 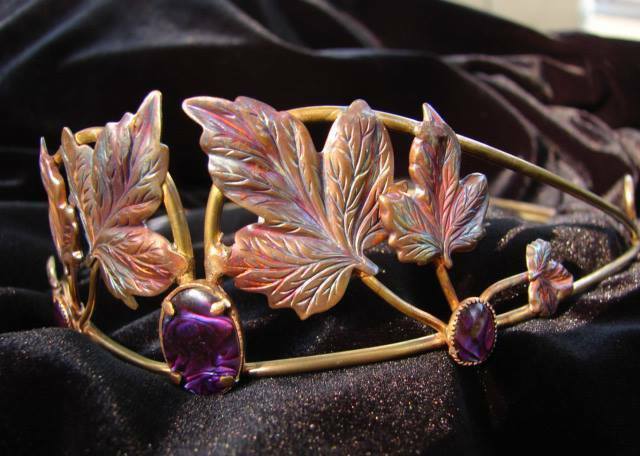 Each of the gems, both for the crowns and standalone, are created out of dichroic glass. And while many of the crowns are based on fantasy fiction such as J.R.R. Tolkien’s “The Lord of the Rings” series, pagan imagery can also be spotted on the crowns. Roger said he aims at the elvish cosplayer customer base because authentic looking crowns are hard to craft without the knowledge, but he has also found success at Pagan conventions such as Pagan Picnic in St. Louis. Between appearances at conventions, Roger said he spends a lot of time fulfilling orders from the Moria Silver website as well as from conventions – including two in California for 250 crowns each. Fulfilling so many orders seems like it would be immensely time consuming but his process allows him to produce multiple at once. He uses a process of multiple sets of glasses to protect his eyes from the torchlight but also to magnify what he’s working on. For his rings the process is a bit easier. He can make as many as 100 an hour – a process he’s worked out since he was 19 years old. He said he wraps the silver wire around a mandrel and fits it to an electric drill. After pulling the wire he cuts it for each individual ring. Then each ring is soldered and hand hammered and then goes into a polisher with stainless steel BBs and it makes them shiny. Visit the Moria Silver website by clicking here. Follow them on Facebook here.